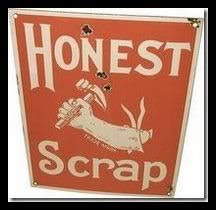 Cris over at GOODEness Gracious bestowed upon me the Honest Scrap award earlier today. Thanks Cris! I "heart" you and your blog...you've inspired me time and again. 1. Just this week I cried while watching the season finale of Glee (for the second time) during the season where the students sang to their teacher...OMG. 2. I also cried watching Deadliest Catch and seeing Captain Phil's sons struggle with their father's illness. 3. Brings me to my utter fascination with reality TV - not like the Bachelor or Dancing with the Stars, but like Run's House, Jersey Couture and Hoarders. 4. Housekeeping is NOT my forte and sometimes (OK, most of the time) my house looks like a Hoarders house in training. 5. If there's a styrofoam cup from McDonald's in my house, there's probably a little bit of Malibu in it along with my Coke Zero. 6. If I could live on chocolate, bacon and Coke Zero (with a little bit of Malibu), I'd be a happy, happy woman. Throw in some cheese and it's utopia. 7. I love to travel and am itching to go somewhere fun SOON. 8. I've been to 33 states (including Hawaii and Alaska and a couple of others that I don't count because it was just in their airports) and a baker's dozen different countries. 9. I've visited the 3rd largest sugarcane farm in the world (in Guatemala) and I can HONESTLY say that I'll take corn production over sugarcane production any day...we don't burn our crop to get it out of the field! 10. Just watched a Lays commercial showing the farmers that grow their potatoes and think it's cool that I know so many farmers that grow the food I eat. Also, check out these other blogs that I gave a shout out to earlier this week. gotta have my Zero also! I love me some reality tv too. HA HA! So glad I don't have to share any truths!! You are definitely honest!! BTW...are you home this week?? lol!